In this Newbery Honor-winning novel, Gary D. Schmidt offers an unforgettable antihero. 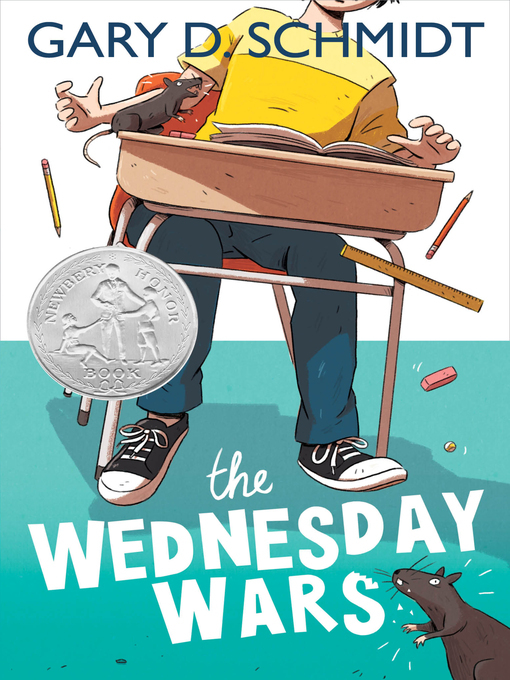 The Wednesday Wars is a wonderfully witty and compelling story about a teenage boy's mishaps and adventures over the course of the 1967–68 school year in Long Island, New York. Meet Holling Hoodhood, a seventh-grader at Camillo Junior High, who must spend Wednesday afternoons with his teacher, Mrs. Baker, while the rest of the class has religious instruction. Mrs. Baker doesn't like Holling—he's sure of it. Why else would she make him read the plays of William Shakespeare outside class? But everyone has bigger things to worry about, like Vietnam. His father wants Holling and his sister to be on their best behavior: the success of his business depends on it. But how can Holling stay out of trouble when he has so much to contend with? A bully demanding cream puffs; angry rats; and a baseball hero signing autographs the very same night Holling has to appear in a play in yellow tights! As fate sneaks up on him again and again, Holling finds Motivation—the Big M—in the most unexpected places and musters up the courage to embrace his destiny, in spite of himself.